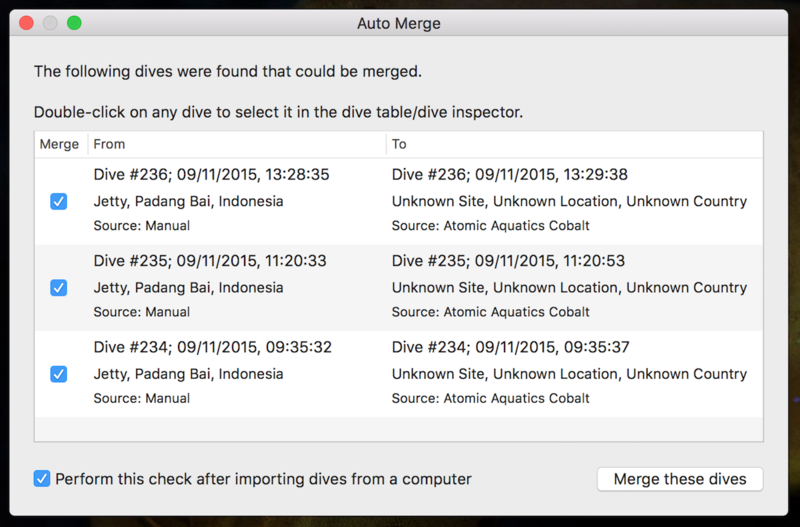 Traditionally MacDive for macOS was used to log everything about your dives. Now that it's available for mobile, there are new workflows to consider. One common workflow is to record the rough details of a dive - the location, who you dived with, what you saw, the conditions, etc - while you're still on the boat or even after a day of diving. Often, this can be while you're on a dive trip or holiday. However you may want to download your dives from a dive computer once you return home, so the question becomes: how do you merge all of that information together? The most common reason for merging your data is to get the details you don't want to forget merged in with dive computer data, once you have a chance to download it. MacDive for OS X can merge manually entered data with downloaded profiles so that you get one dive with all of the information you want. AutoMerge will find any dives that have been entered manually and compare them to any dives that have been downloaded from a dive computer. The process is straightforward. Make sure you're happy with the suggested merging, and then click Merge! If you don't want to merge particular dives then you can uncheck the Merge checkbox in the left-hand column of the table. Nothing further is required. The process is designed to be as quick and easy as possible. When you click Merge, various details from the From dive will be copied into the To dive, and then the From dive will be removed. These details include things like the location, conditions, dive master, notes, images, and any tags, types, pieces of gear, critters etc that you have recorded manually. MacDive will automatically check for dives that can be merged after any download completes (you can disable this check if you'd like). Alternatively, you can always access it via Tools > AutoMerge Dives. A useful workflow may be to log your details on MacDive for iOS while you're away diving, and then sync your data via the cloud when you return home. After doing this, import from your dive computer, and MacDive can show you the AutoMerge window. If you forget to sync first it's no problem - simply select AutoMerge from the Tools menu. There are two things that decide whether dives can be matched. The first is the data source. Only manually entered dives can be merged with downloaded profiles. For the most part this should not be a concern. You simply create a new dive manually (for example on your iPhone while you're on the boat), and when you get home, you download profiles from your dive computer. The other key factor is the date and time. So long as the starting date and time of the manual dive and the downloaded profile are within a few minutes, the dives will be found to merge. The final condition is whether a diver is set. If no Diver is set, any dives are considered for merging. If a diver is set on the manually entered dive, then the same Diver is required on the downloaded dive in order for a match to happen. This means you can merge dives for multiple divers more accurately.